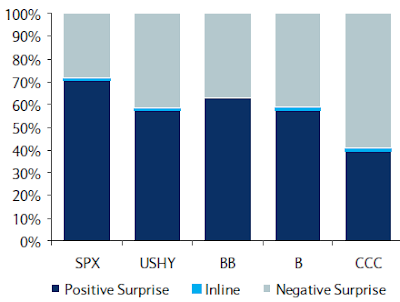 Positive earnings surprises coming out of the S&P500 companies are masking somewhat weaker results among the more leveraged companies. In fact the weaker the group of firms (at least based on ratings) the higher the negative surprise percentage - particularly in the CCC rated firms. It looks as though stock analysts have been too sanguine about earnings recovery among the highly leveraged companies. This trend may be explained by the stronger firms' ability to tap incredibly inexpensive debt financing (dramatically reducing interest expense by refinancing existing liabilities), while the weaker companies' cost of funds is still relatively elevated. A number of leveraged companies have also been exposed to the resource sector which at least in part is driven by China. That may have been an advantage a year ago but is no longer one.